The 2017 North Atlantic hurricane season was one of the most active and destructive on record. In a paper published in the journal Monthly Weather Review, a team of researchers co-led by CICS-NC’s Carl Schreck explore the small- and large-scale meteorological conditions that led to such an active season and reveal how changing conditions during the year resulted in a season that was more active than expected. By understanding the ingredients that led to this record-breaking hurricane season, the scientists hope to improve early-season projections of hurricane activity. The 2017 North Atlantic season saw 17 named storms, compared to a median value of 12 over the last 30 years. Ten of those storms reached hurricane strength, compared to a 30-year median of 6.5. Six of those became major hurricanes, registering Category 3 or higher on the Saffir–Simpson scale, which is triple the 30-year median of two such storms per year. For the first time on record, two Category 4 hurricanes made landfall on the continental United States in the same year. Tracks of all North Atlantic named storms in 2017. Figure courtesy of NOAA’s National Hurricane Center. Other metrics, including total hurricane days and accumulated cyclone energy (ACE), ranked in the top 10 compared to the long-term historical record. September 2017 was particularly notable, as the month set records in the basin for the number of days with a named storm, the number of hurricane days, and the number of major hurricane days. The ACE value for September was 3.5 standard deviations greater than the 1982–2010 average. In fact, September 2017 saw a higher ACE value than any other calendar month on record for any global tropical cyclone basin. The result was more than $260 billion in total economic damages in the United States alone, approximately 200 direct fatalities, and likely hundreds or thousands of additional indirect fatalities in Puerto Rico as a result of Hurricane Maria. Forecasts released in April through June of 2017 generally called for a below-average or near-average hurricane season. The authors of the study note that those forecasts generally did not anticipate changes that occurred in the El Niño–Southern Oscillation (ENSO) and in Atlantic sea surface temperatures (SSTs) during spring and summer. Those changes led to more favorable conditions for tropical cyclones (TCs). Revised forecasts later in the season did call for above-average activity, but the season still exceeded those revised expectations. Expected El Niño conditions, which would have tended to suppress storm activity, failed to develop. And, while tropical Atlantic SSTs were cooler than normal early in the year, they warmed significantly during the hurricane season, particularly in the main area where Atlantic tropical storms tend to develop. Not only did 2017 have an unusually large number of storms, but more of those storms affected the US than in recent years. Winds that tended to turn hurricanes to the north and east over 2006–2016 were not in place in 2017, leading to more westerly tracks for many of the storms that then brought significant impacts to islands in the Caribbean and the contiguous US. Vertical wind shear – the differences in the wind speeds at different altitudes – is another key factor, with lower amounts of wind shear generally being conducive for TC activity and higher amounts generally suppressing activity. The lack of an El Niño meant generally weaker wind shear for the peak of the season, particularly in the areas where Hurricanes Irma, Jose, and Maria reached maximum intensity. Fortunately, despite warm SSTs and weak La Niña conditions, October was a relatively quiet month. That appears to be due in part to the Madden–Julian Oscillation, or MJO – a large-scale pattern of atmospheric circulation and convection that propagates eastward around the globe and has a strong influence on TC formation. In October 2017, the MJO amplified and moved through phases that tend to increase vertical wind shear and suppress TC formation in the North Atlantic. 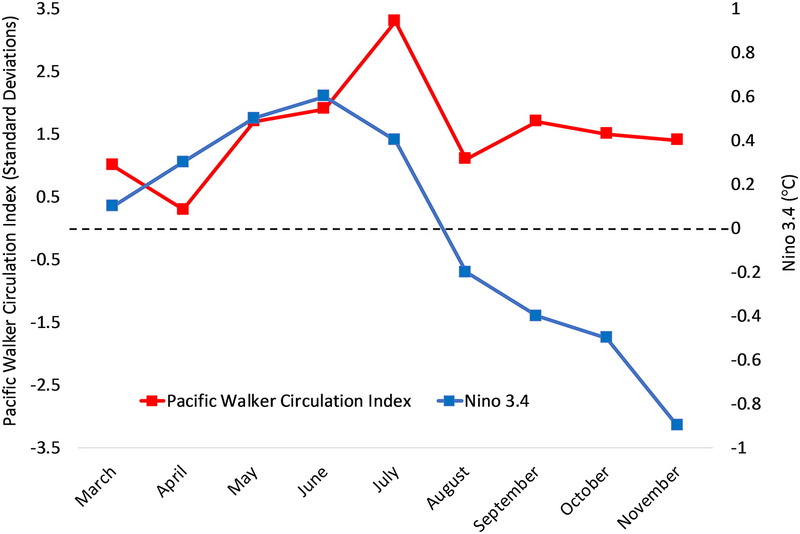 In 2017, the standardized Pacific Walker circulation index (red) was a better indicator of an active North Atlantic tropical cyclone season than the Niño-3.4 index (blue). To help improve seasonal forecasting in the future, the team examined other particularly active seasons from 1982–2017 to look for similarities with 2017. The six most active seasons, including 2017, all featured a positive Atlantic meridional mode (AMM), which favors warmer tropical Atlantic SSTs to fuel stronger hurricanes. Five of those seasons also featured neutral-to-La Niña conditions. Both of these factors were present in 2017, but neither was exceptional enough to indicate the extreme activity observed. La Niña and El Niño are traditionally observed based on SSTs in the Pacific. The atmospheric component of ENSO can also be measured using the Pacific Walker circulation index, which is a measure of where tropical Pacific large-scale ascent is favored (supporting deep thunderstorm activity) and where large-scale ascent is inhibited (suppressing deep thunderstorm activity) . The authors found that in 2017 the Walker Circulation index would have provided a better indicator of the impacts of La Niña than using tropical Pacific SSTs. 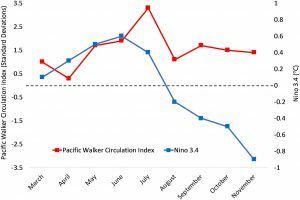 Future seasonal forecasts could be improved by using the Walker Circulation Index. Despite the advances in seasonal forecasting from this and other studies, these forecasts remain a challenge. This past year, 2018, was no exception as hurricane activity was again well above normal despite a developing El Niño event in the Pacific. As in 2017, the Walker Circulation Index remained more La Niña-like, which may have contributed to the enhanced activity. The authors are planning another study examining 2018 to continue deepening our knowledge of these events.